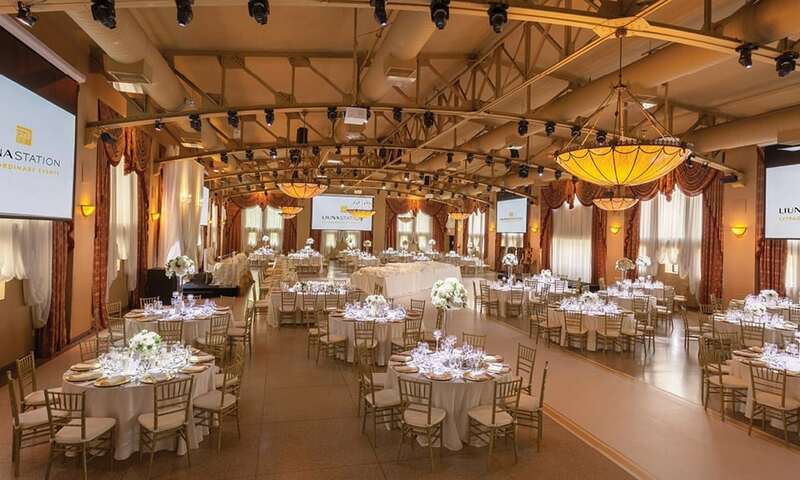 We have grand ballrooms, but it's bigger than that. 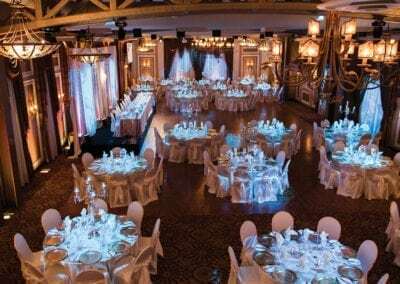 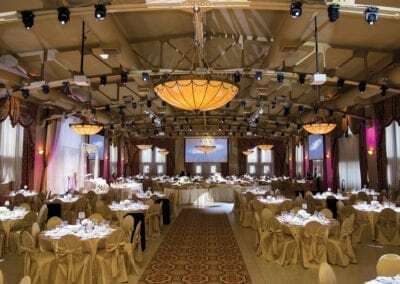 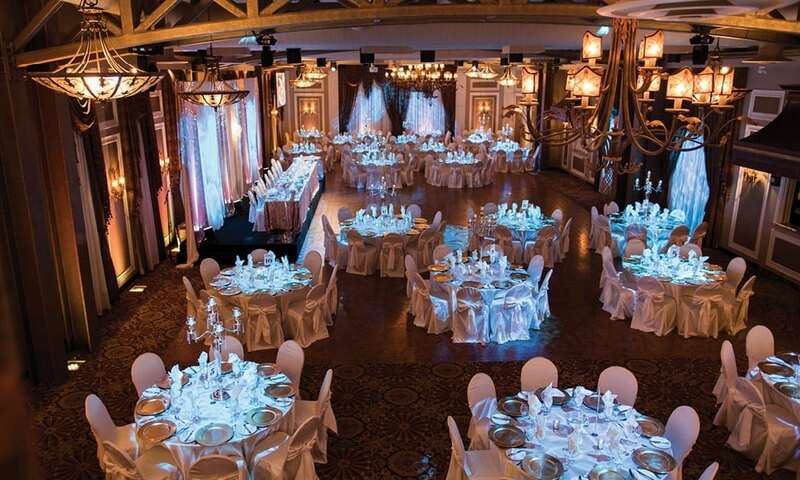 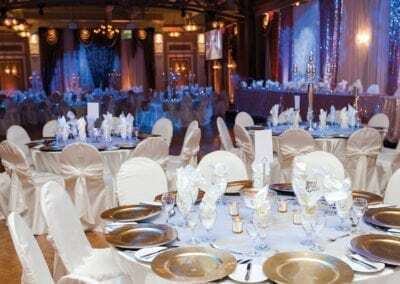 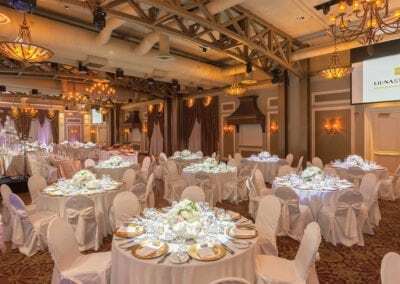 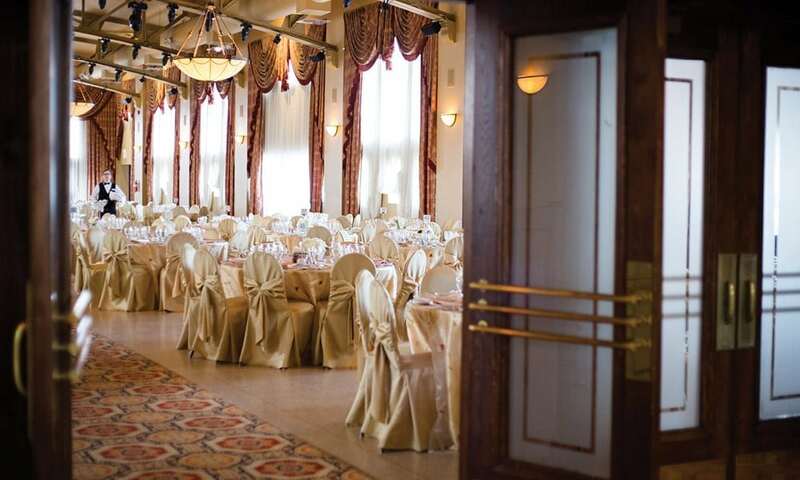 Our Grand Central Ballroom is a historically exquisite banquet hall and has been beautifully restored to reflect the grace and sophistication of years gone by. 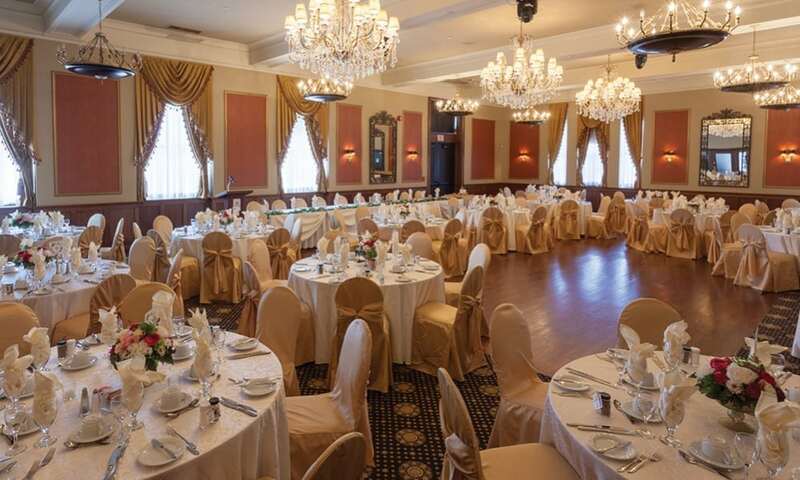 This superb ballroom can comfortably accommodate up to 650 guests for a wedding reception. 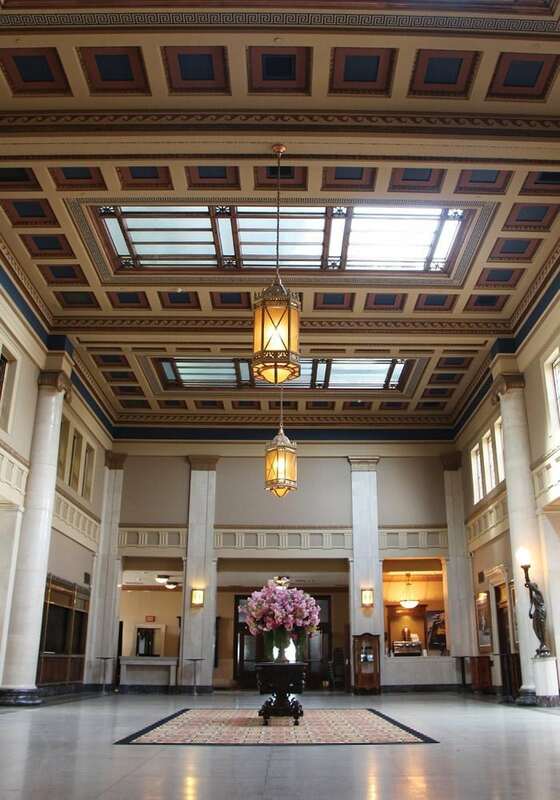 Its immense structure, formerly the concourse, served as the waiting area for many eager travelers or relatives awaiting new train arrivals. 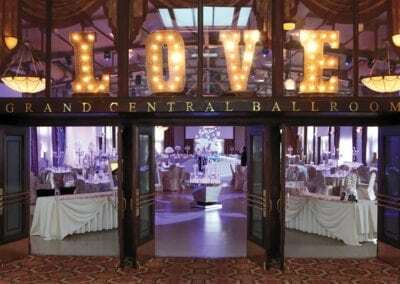 The Grand Central truly defines the concept of ballroom. 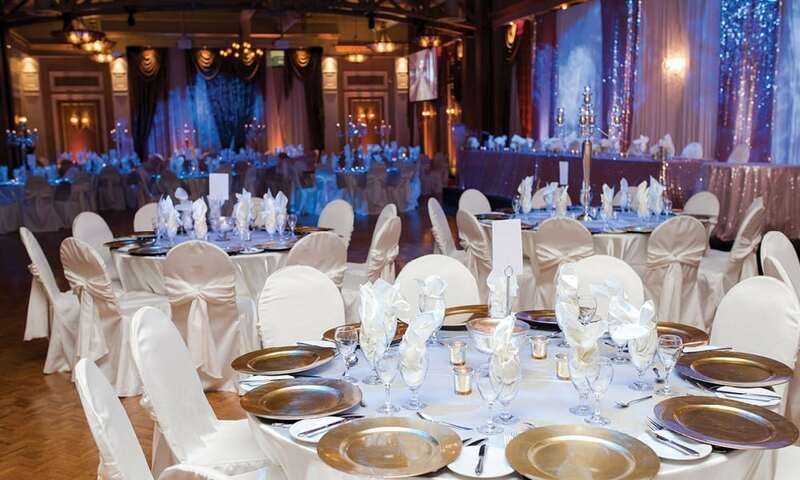 LIUNA has invested time and effort into decorating the room so you don’t have to! 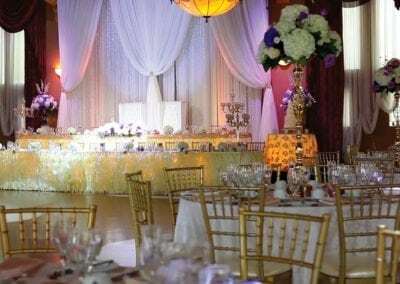 With its Versace curtains and elegant lighting, any decor you add to it to personalize your special day will only add to its grandeur! 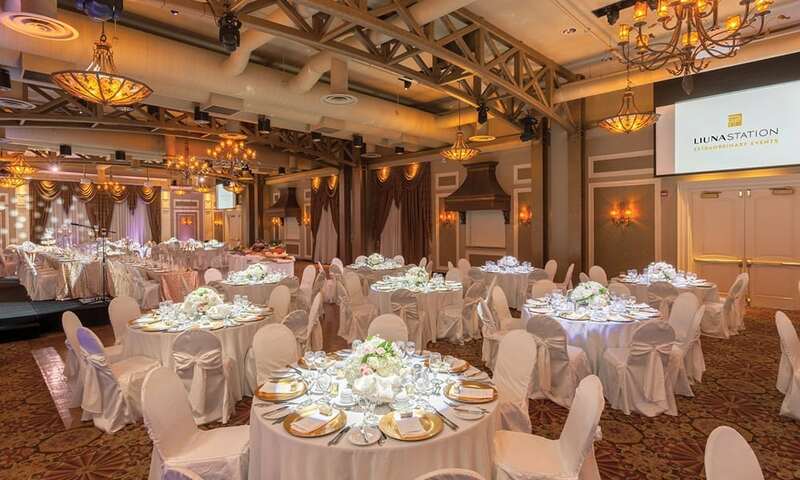 Luxurious despite its size, the Grand Central is very warm and inviting. 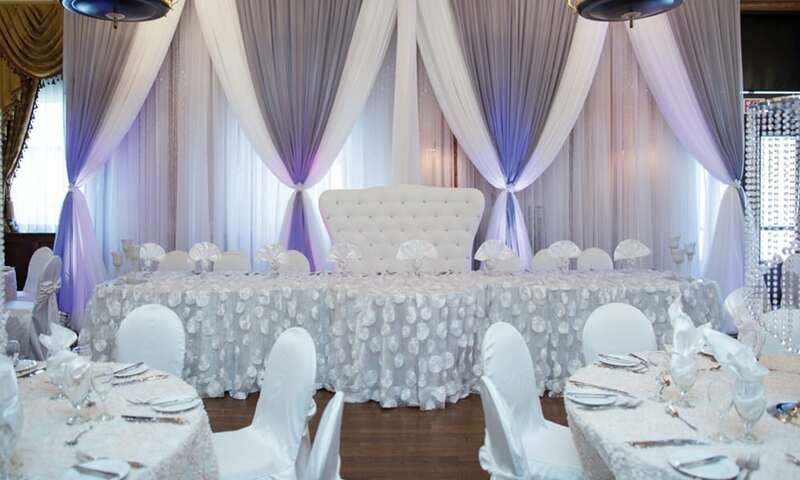 This space is easy to decorate and effortlessly transforms your vision into reality. 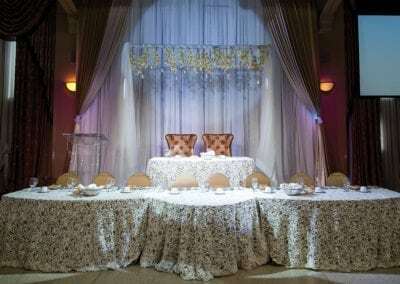 Its spacious nature allows for your guests to sit comfortably in table rounds or a kings table set up. 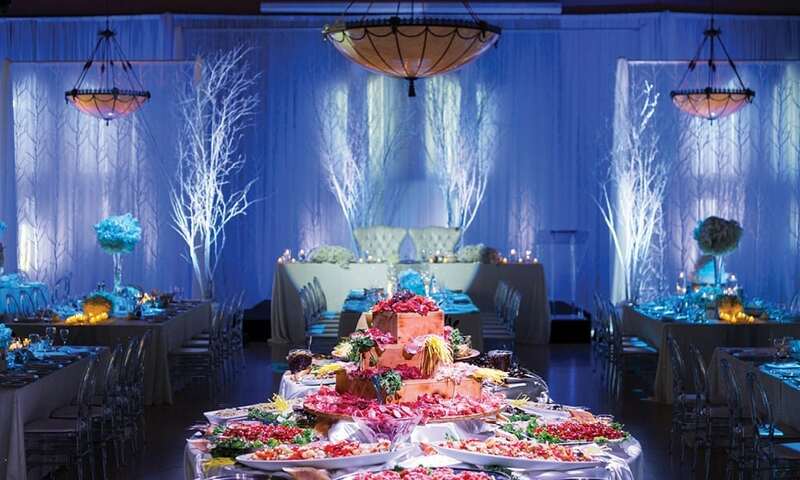 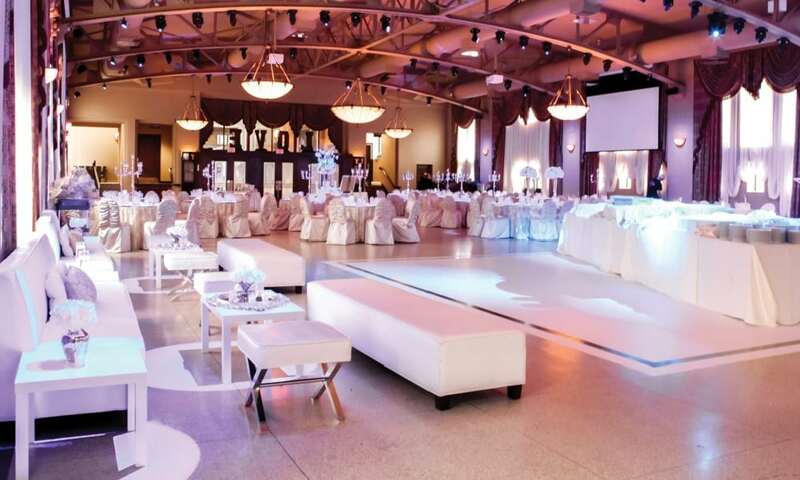 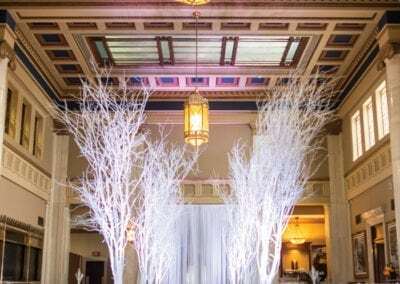 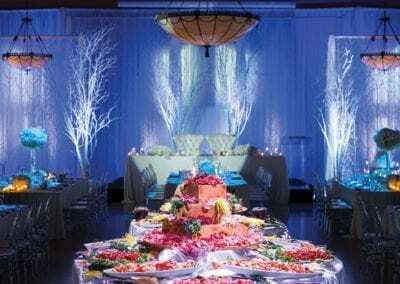 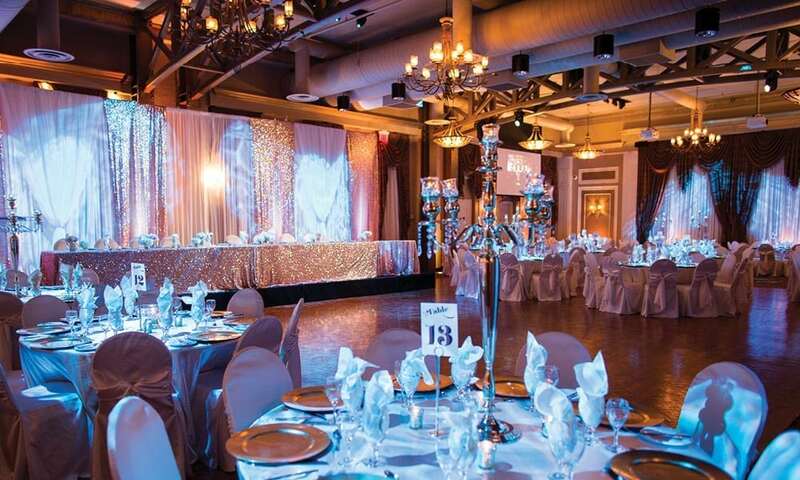 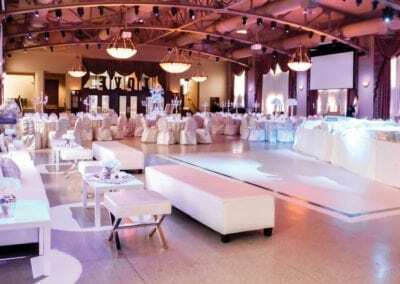 There is space for a dance floor, martini bars, ice sculptures, chocolate fountains, antipasto bars and buffets. 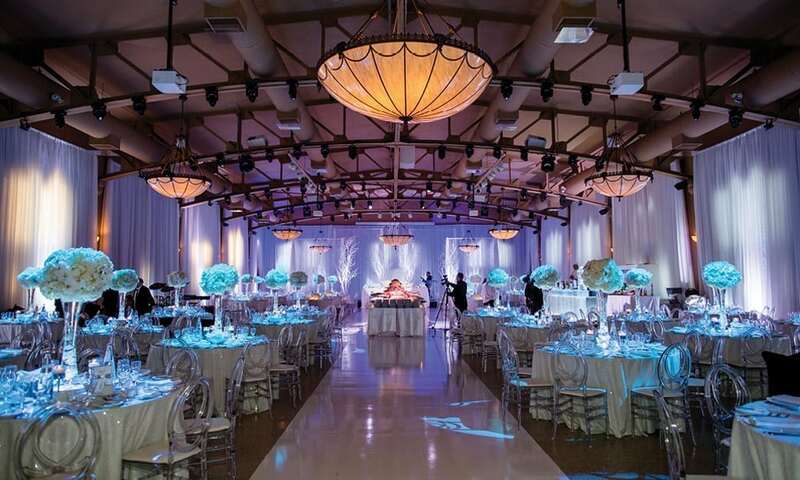 This majestic ballroom provides an extraordinary canvas for you to create a special day. 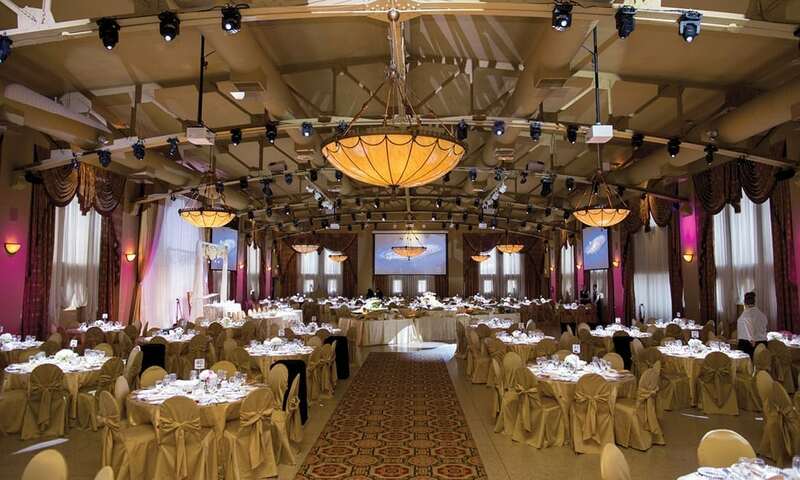 Our newest ballroom is The King George – built at track level, where the former rails once stood. 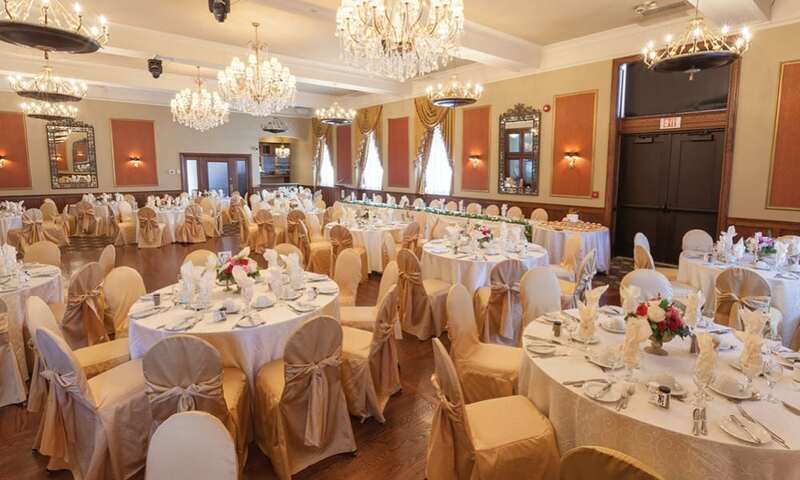 Named after the first royal to pass through the station, The King George has the elegance and sophistication of another era. 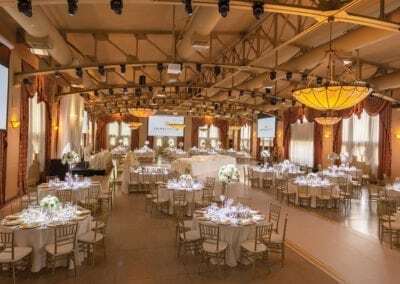 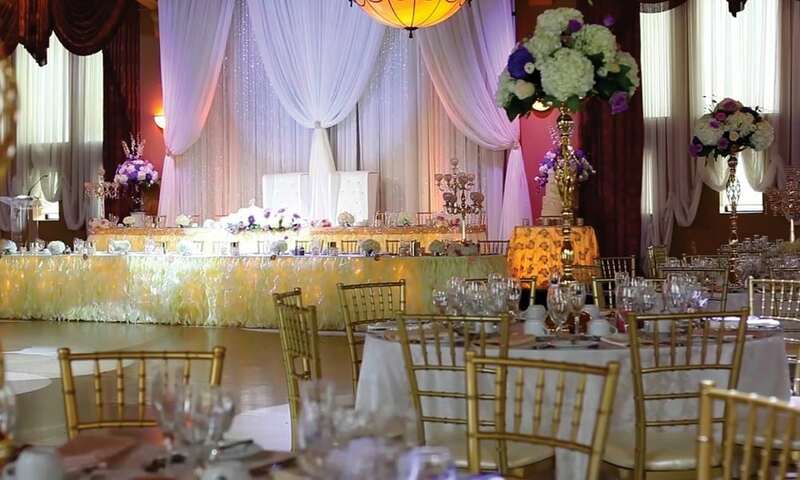 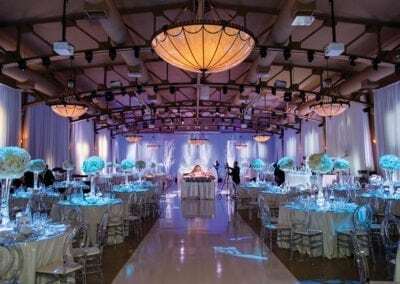 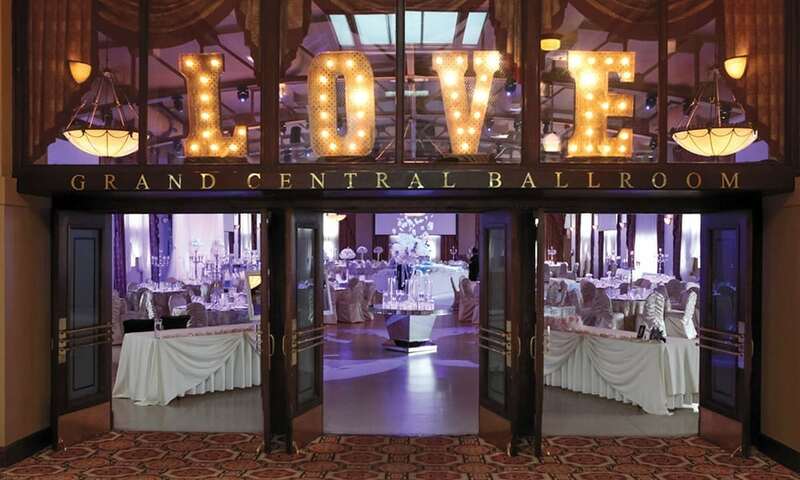 This ballroom showcases the same historical structure as the already popular, Grand Central Ballroom. 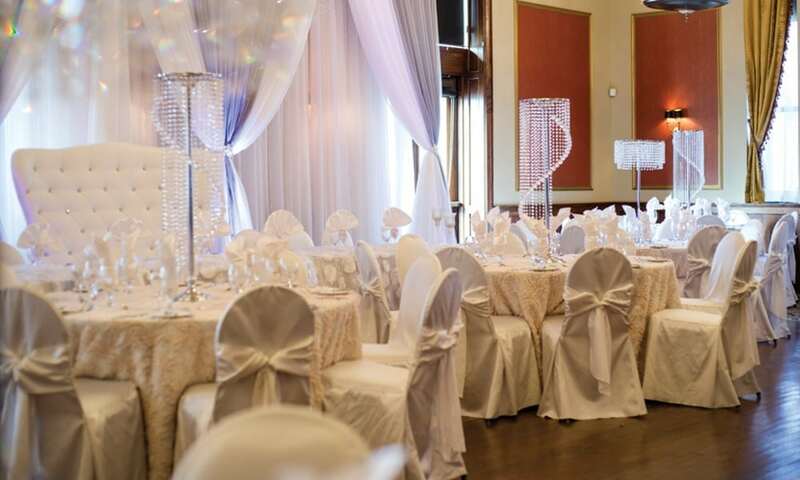 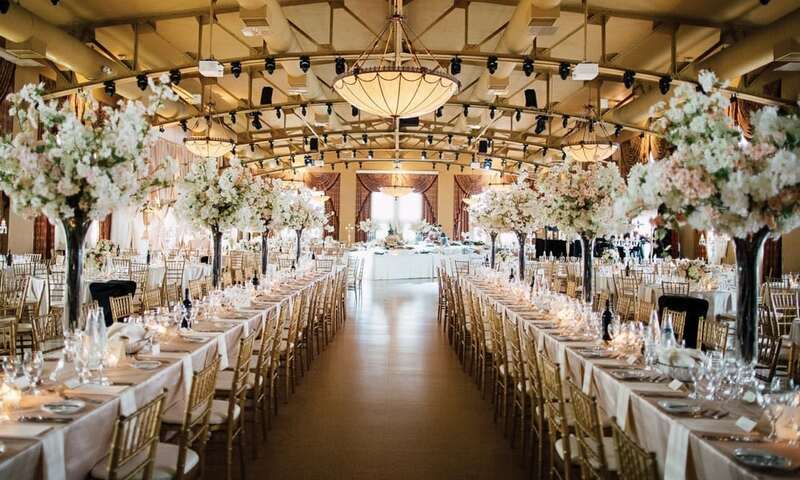 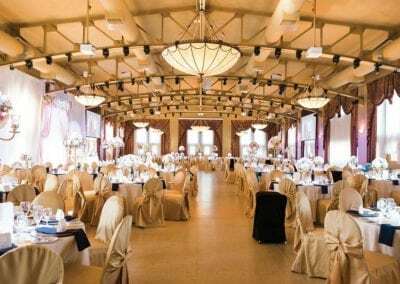 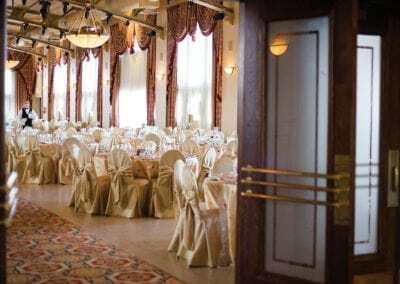 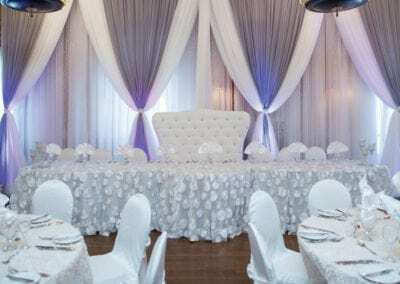 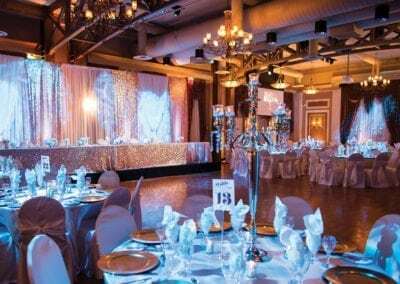 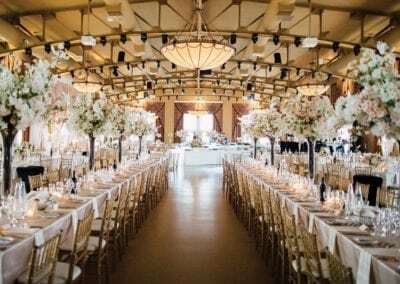 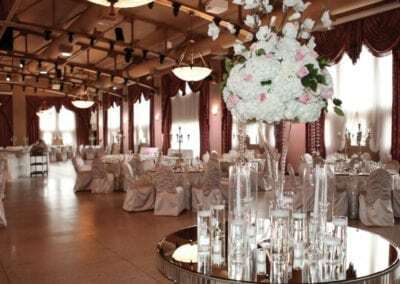 This splendid ballroom has some amazing features including its own private entrance and two exquisite bars with granite counter tops in its lobby and can accommodate up to 270 guests for a wedding reception. 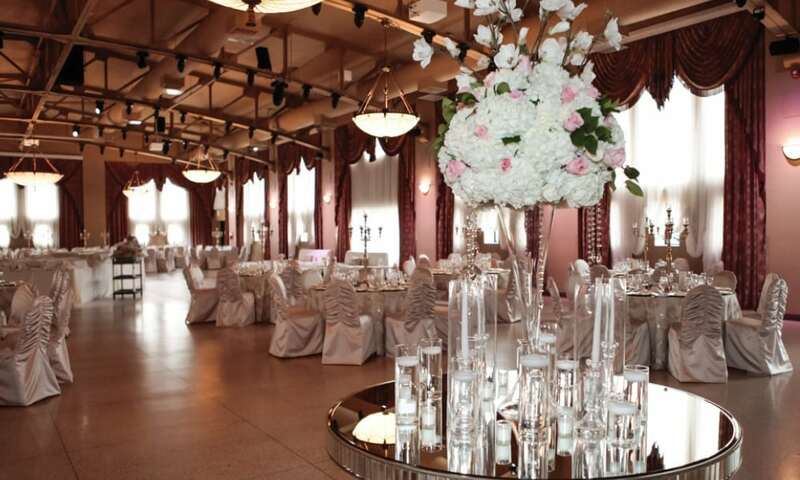 The lobby itself is a luxurious venue. 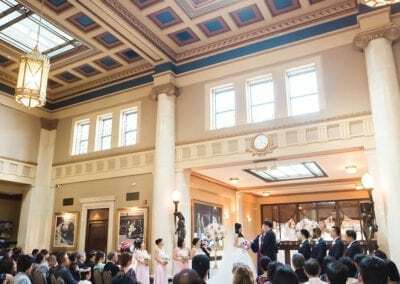 With generous amounts of light and its ornate ceilings, the spacious airiness of this hall is perfect for photography. 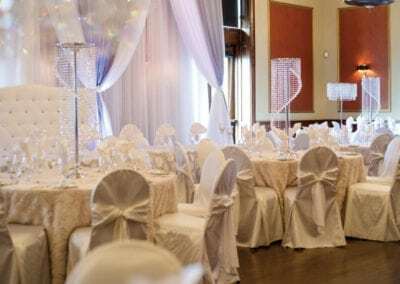 The King George boasts VIP powder rooms and suites with luxurious chairs and mirrors available for the Bride, Groom or Bridal Party to get ready. 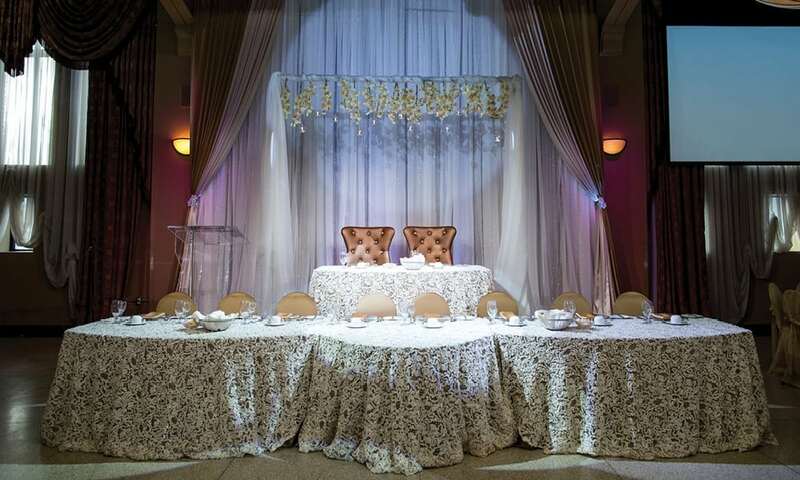 With this room, you also have access to a fully licensed patio that includes a beautiful cast bronze fountain. 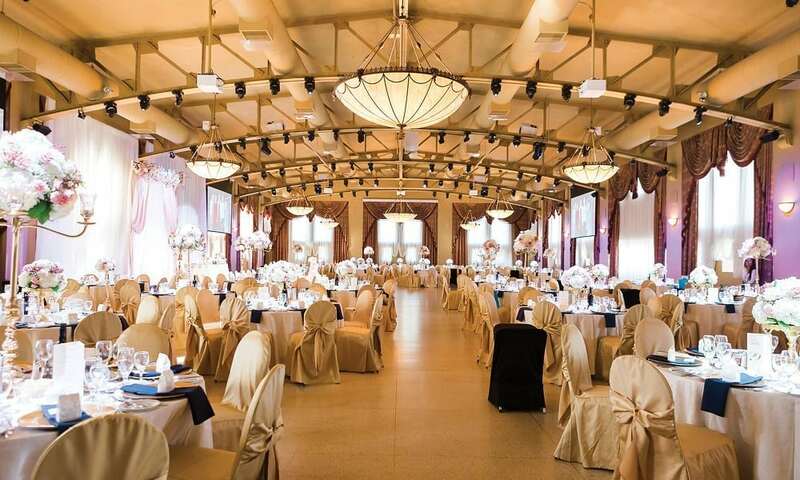 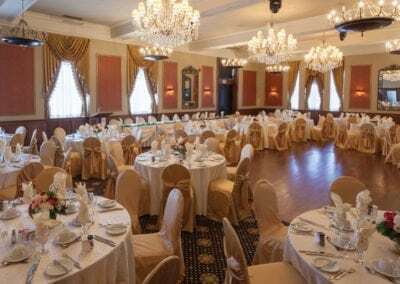 The Continental Express Ballroom is the former restaurant of the original CNR station, restored into a classic ballroom that can host a wedding reception up to 150 guests. 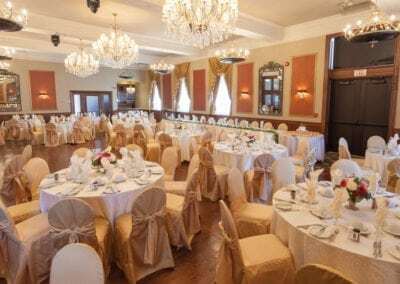 This room is ideal for more intimate events ranging from wedding celebrations to bridal showers, baptism, communions, confirmations or corporate events where the more quaint scale of the room allows for more direct engagement. 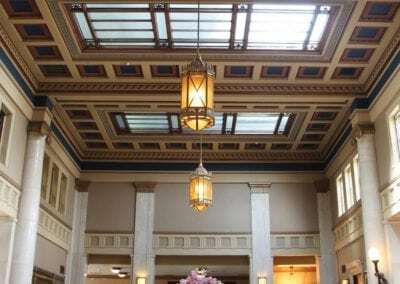 Our distinctive Grand Lobby, complete with original marble columns and an exquisite gold and copper ceiling will leave a lasting impression on you and your guests. 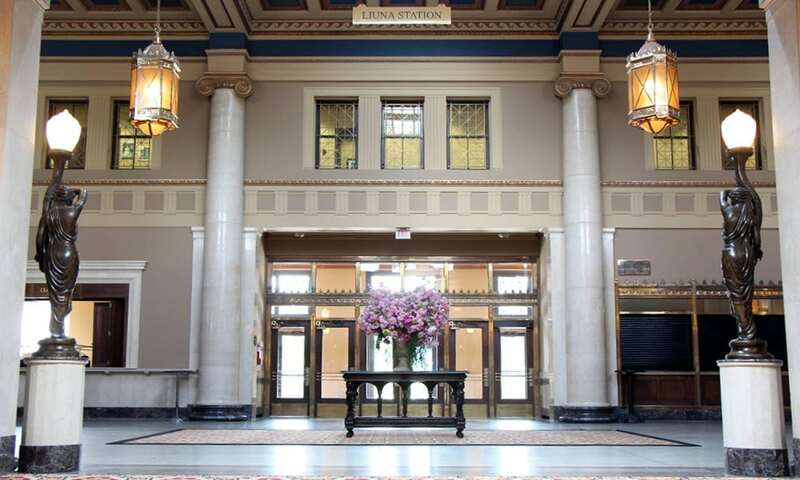 Truly an example of a golden era, our Grand Lobby boasts neo-classical design and superb craftsmanship. 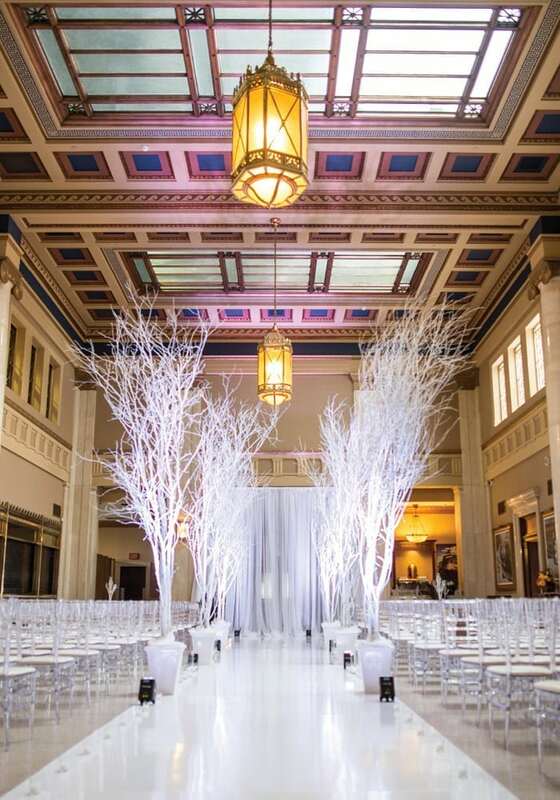 Our gorgeous bar was once an operating newsstand and our coat check was formerly a ticket stand. 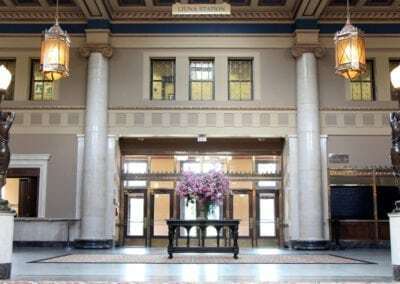 You would never believe the lobby still has its original Terrazzo flooring from 1929. 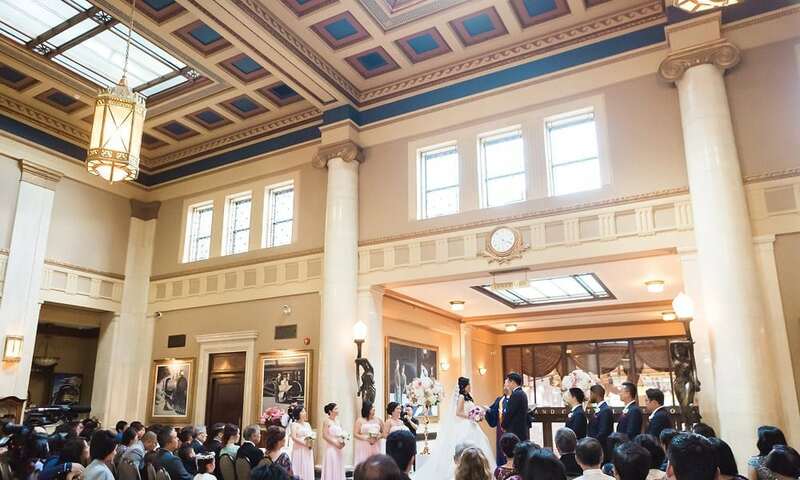 The Grand Lobby is the ideal spot for cocktail receptions and wedding ceremonies.